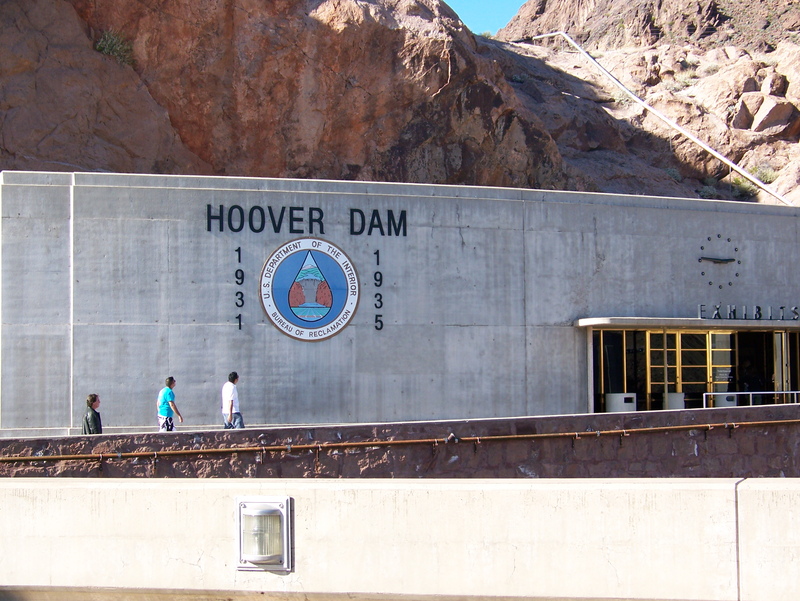 The Hoover Dam is one of those iconic, American sights I didn’t want to miss on a trip to Las Vegas. 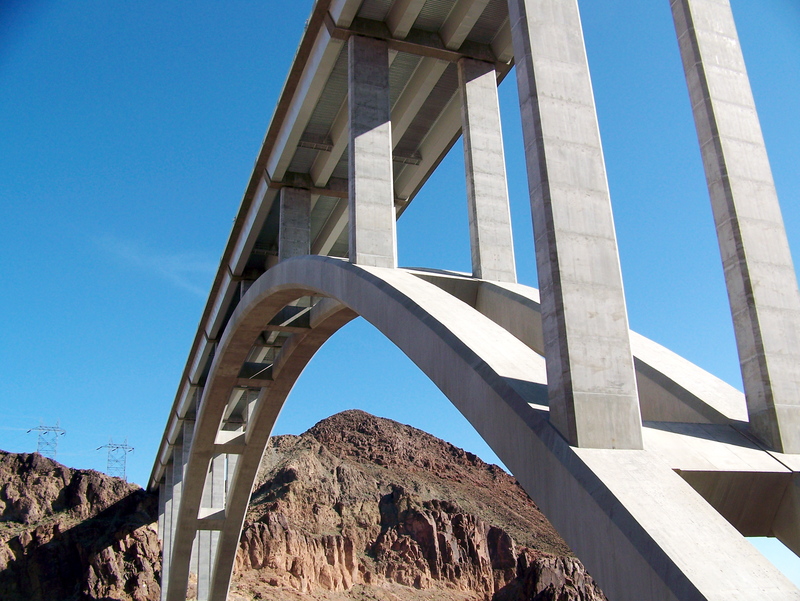 The art deco decorations, the bright blue waters of Lake Mead, the tons of concrete (concrete was delivered in specially designed buckets hung from cables; each bucket when full weighed 20 tons, was 8 cubic yards of concrete, and when poured into a column added only 1 inch to its height), the brand-new Mike O’Callaghan-Pat Tillman Memorial Bridge across the Colorado River and all of the engineering feats needed to complete this massive project were the things I wanted to see. I didn’t know much about the bridge or the dam before heading out. My research was spent checking prices, and when I saw that there were fees to park and fees to enter the visitor’s center I was discouraged. Jon’s national park pass would not be any help, either. Jon wasn’t nearly as excited about seeing the dam as I was, so I knew convincing him of having to pay to do anything would be a hard sell, so I didn’t give up. I found that the walkway across the bridge is free, and its entrance is located just before the bridge begins. Then I found that there is free parking on the Arizona side of the bridge, which is accessible from the first exit of the highway in Arizona. That would allow viewing the dam and bridge from both directions and would avoid all fees. Paying $8 to enter the visitor’s center didn’t sound too great, anyway, because I’m not always the most patient when it comes to reading placards. I’m not always that patient for tour guides, either. The execution of my grand plan backfired. There is no pulloff from the highway into the bridge parking lot, though we could see it as we drove past. The drive across the bridge was as anticlimactic as expected, because the sides are so high that you can see only up, not down towards the river and dam. 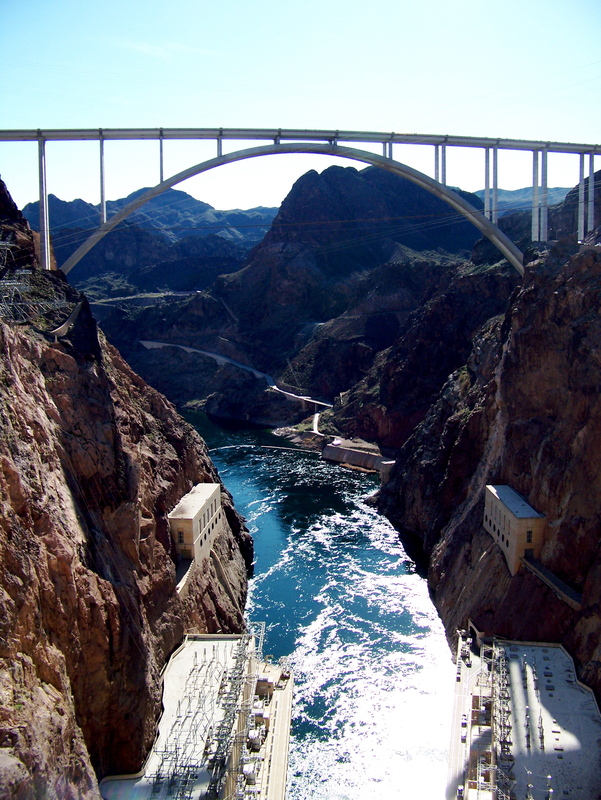 Then after exiting the highway in Arizona, we find the road to the Arizona side of the dam closed. We stop, with me exceedingly frustrated. AT&T didn’t have enough signal there for me to consult the Internet, so the only thing we could do was return to the first Nevada exit on the western side of the Colorado River and wait in the security line that I hoped would lead to the bridge parking and eventually to the dam, and I had resigned myself to having to pay to park. After finding a free parking spot in the overflow lot across from the entrance to the bridge, we hiked up to the bridge, stopping to peruse some of the informational signs along the way. The view, upon arrival, was breathtaking. The blue, orange and white colors contrast together so well. There are cars way down there near river level. How did they get there? 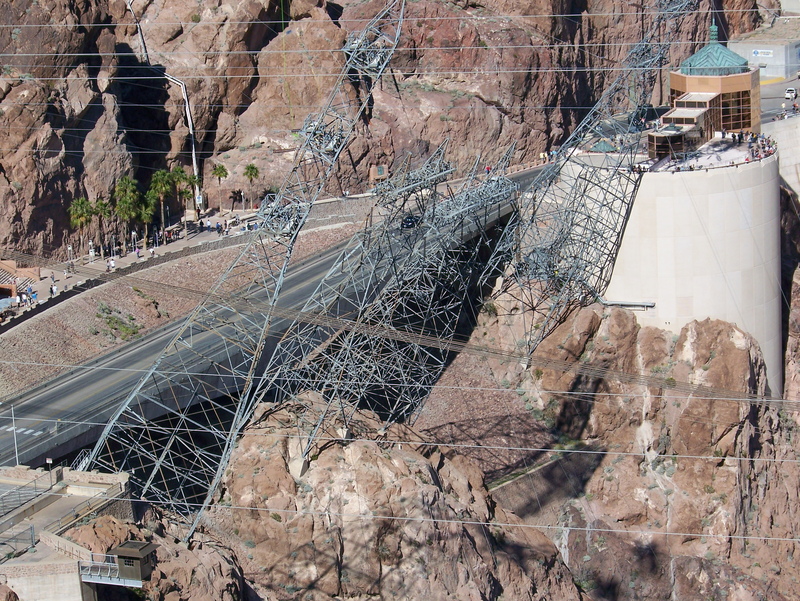 Look, there are electrical towers built on an angle, hanging precariously off the side of the canyon walls. And wait a moment. There are cars driving across the dam! Everything I read said cars no longer drive across the dam. And there are cars parked in Arizona! For a short moment my frustration escalates again, but then, by golly, we can drive there too and still hopefully find more free parking. Then I started paying attention to the sounds. 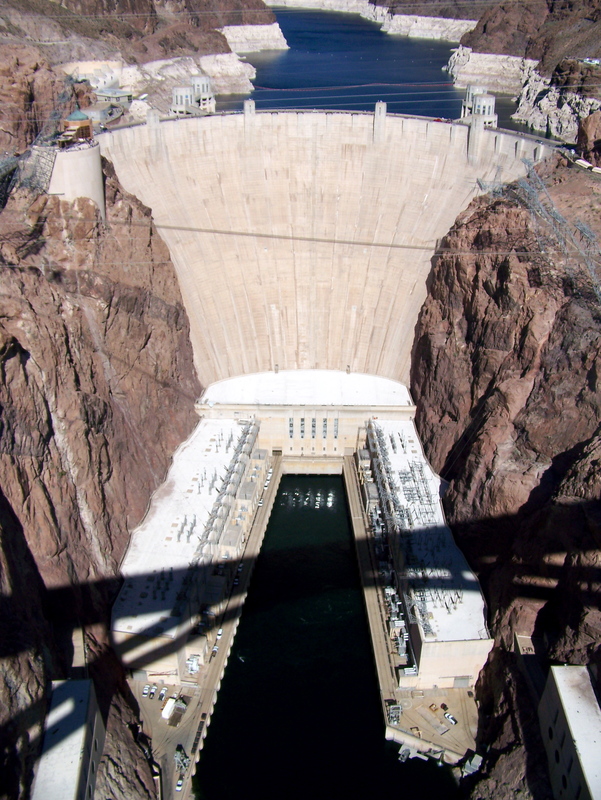 I’m the daughter of an electrician and have seen a variety of dams. There wasn’t much noise. My father’s guess is that the generators weren’t running. Nor was there any rushing water from anywhere. I expected frothy rapids at the base of the dam with a loud roar. My final moment of giddy surprise was when I paid attention to the shadow I could see below. It was my first view of the underside of the bridge, with its supports and single arch slowly creeping across the canyon and river. We decided to head down to the dam. I love that Jon doesn’t mind driving, because I can then hang out the open window taking pictures. 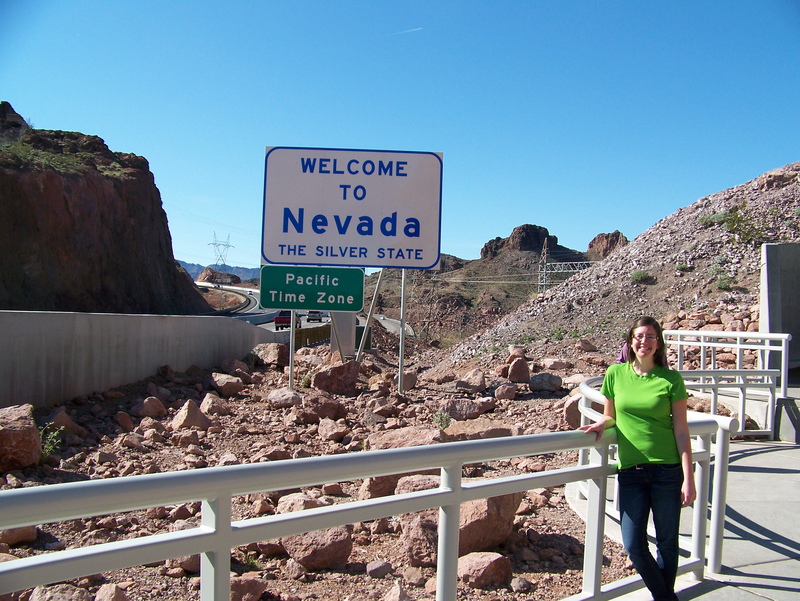 The road then led us across the bridge, crossing into the Mountain Time Zone from the Pacific Time Zone of Nevada. I later found out that visitor traffic could drive across the dam, and that the “no cars on the dam” only means that the highway traffic has been diverted to the new bridge. And after the first parking lot on the Arizona side, which does require payment, the other lots are free. Success was recovered. 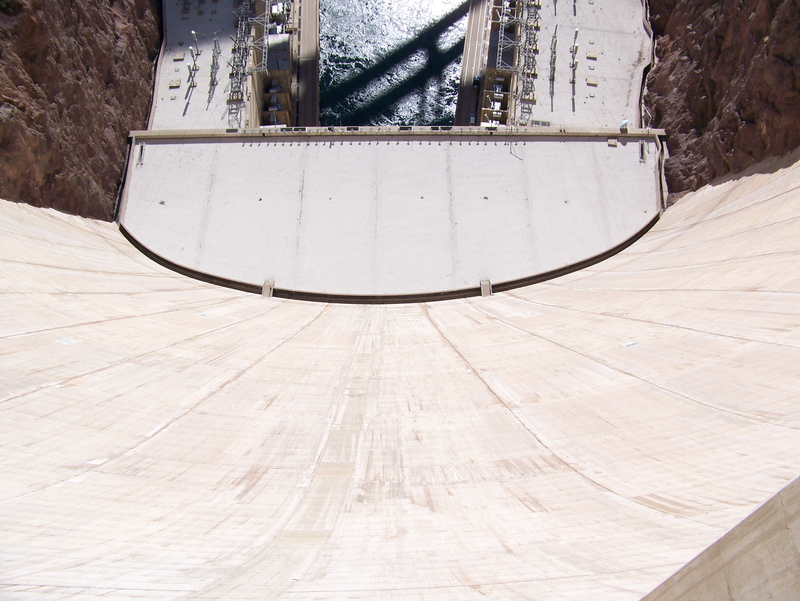 We walked to the center of the dam, admiring the structure. By this time, the water below had picked up a bit, though it still was not anywhere near raging. The sunshine was glorious and I could finally admire the bridge rather than its shadow. My only disappointment was that there were no explanatory placards on the dam, nor were there park rangers stationed on the dam to answer questions. I would have liked to have a few things answered, but I guess that’s the way it goes. To satiate my thirst, I naturally asked my father, and this was a subject he was quite knowledgeable about. He said he learned about the dam from a documentary, and I am currently waiting for it to arrive at my library for my viewing. 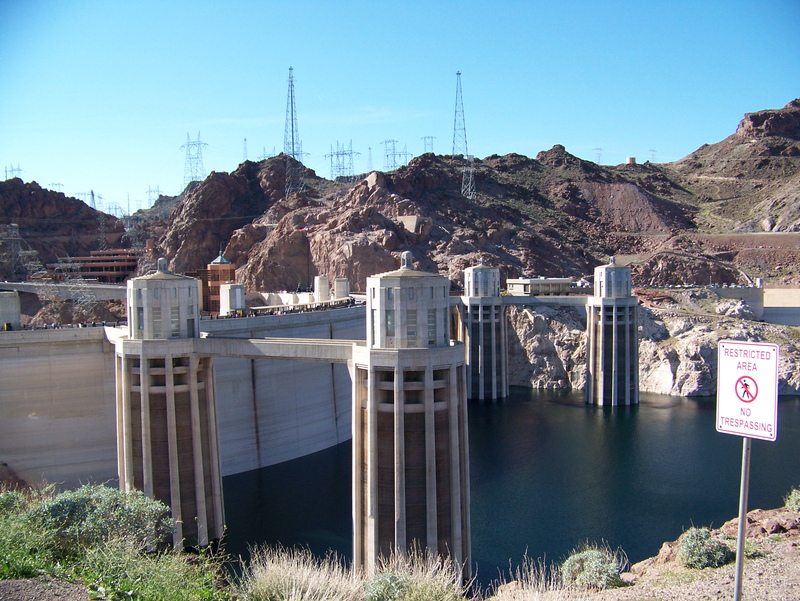 From the Hoover Dam, we took a leisurely drive along the western shore of Lake Mead to Valley of Fire State Park, which is up next! 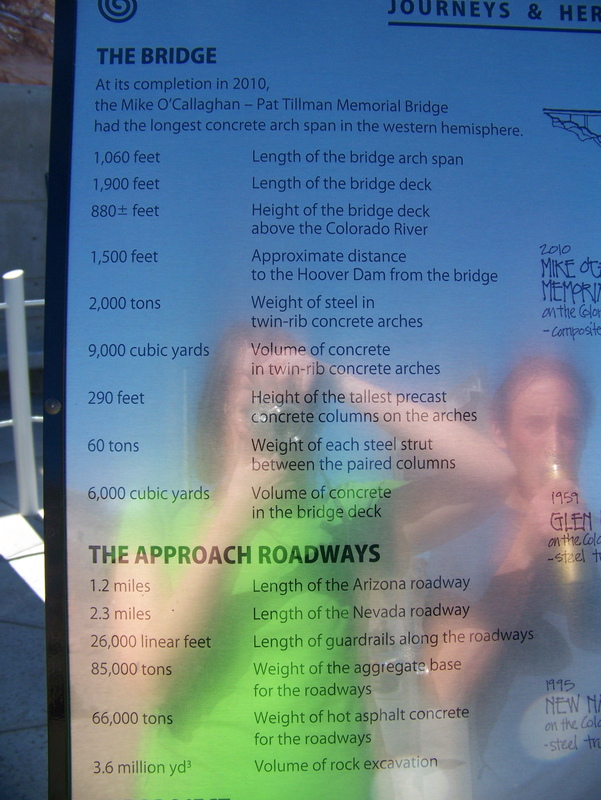 This entry was posted in North America, Planning a trip, Travel Narrative, U.S. and tagged Arizona, Art, Bridges, Dam, History, Las Vegas, Nevada, Photos, Planning a trip, Travel. Bookmark the permalink.